Welcome! Glad to have you in our community! To join, first select a membership level and then fill out the form asking for basic information for you and if applicable, your partner or other adult family member. You will then be taken to our secure online payment processor. After your payment is processed, you will be prompted to add your children to your membership, if applicable. 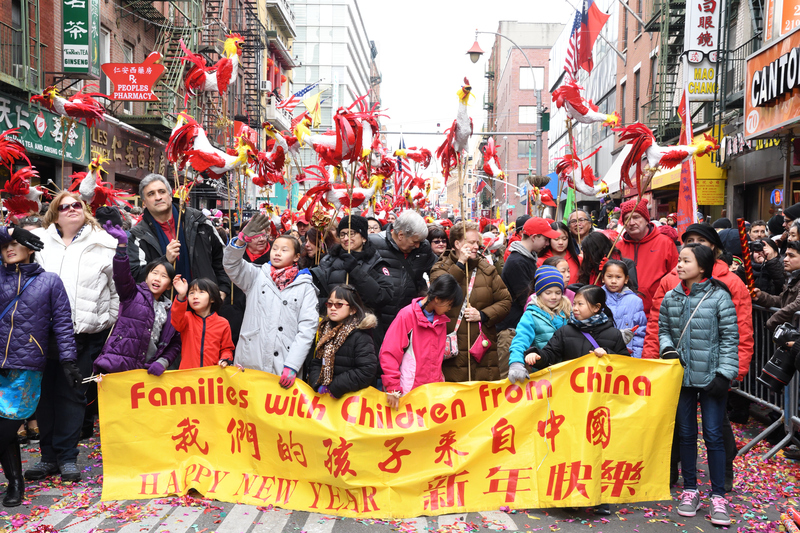 FCCNY families march in the annual Chinatown Lunar New Year 2017 parade. Year of the Rooster, puppets by Linda Mancini, photo by Susie Yuen. Sustaining - $100.00 (USD) Bundle (unlimited) Subscription period: 1 year No automatically recurring payments Your contribution helps support our continued growth. Benefactor - $250.00 (USD) Bundle (unlimited) Subscription period: 3 years No automatically recurring payments Your financial contribution helps to keep FCC strong and available for all. Lifetime - $500.00 (USD) Bundle (unlimited) Subscription period: Unlimited Support FCC and never renew again! Subscriber - $25.00 (USD) Bundle (unlimited) Subscription period: 1 year No automatically recurring payments Subscriber membership is for those who live outside of the general Greater NY region (tristate area). Subscribers will not receive the benefits of full membership (which starts at $45 for Family) such as event discounts, but will be subscribed to our annual adoptee publication View, and to our listserv, which includes articles and information relevant to our community which extend beyond GNY. Reduced Rate - $20.00 (USD) Bundle (unlimited) Subscription period: 1 year No automatically recurring payments This membership is offered as needed to any families experiencing financial hardship. This is separate from family membership account. Membership in FCCNY is offered on a pay what you can basis and we do not want to prevent anyone who is interested from participating. Our only source of support is membership dues. We have no paid staff and all of our programs and offerings are provided entirely by volunteer members such as yourself. For the past 5 years we have been unable to cover our basic expenses and have needed to rely on our reserves in order to completely fund the organization. If the payment options above truly represent a financial hardship, we are happy to offer alternate payment options and arrangements if you e-mail greaternyfcc@gmail.com.